Editor’s note: This article is part of a WTOP series previewing races and ballot measures, and providing voting information for residents of D.C., Virginia and Maryland. WASHINGTON — Voters in several Northern Virginia counties will be asked to weigh in on numerous bond referendums for Metro, roads, parks and schools, in addition to two statewide constitutional amendments, when they head to the polls on Nov. 8. WTOP breaks down some of the most significant issues voters will see when they cast their ballots. 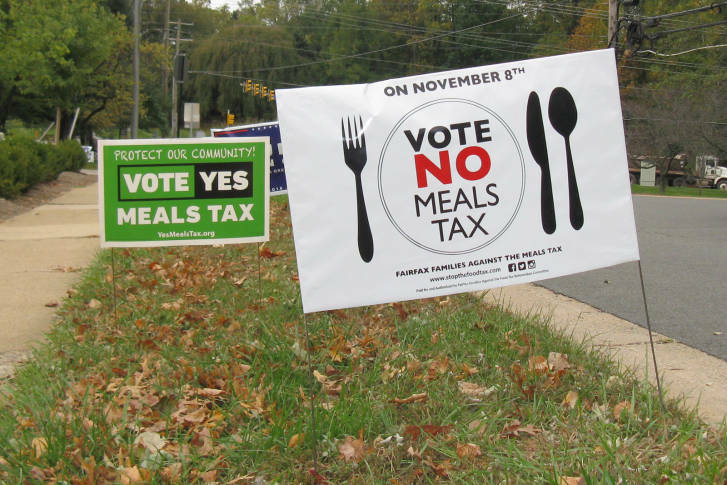 Fairfax County voters will be asked whether to approve a 4 percent sales tax on prepared food and beverages. The meals tax would provide an additional $70 million for the county school system and is also slated to provide $30 million in property tax relief and cover other county expenses. County property owners pay $2.4 billion in real estate taxes each year. County voters defeated a similar request in 1992; county officials scrapped a meals tax referendum in 2014. The tax would be charged for restaurant meals and prepared food purchased from supermarkets, such as rotisserie chickens, or ready-to-eat foods, such as potato salad. Groceries would be exempt. Soda and alcoholic beverages would also be taxed, whether purchased at the grocery store, convenience store or restaurant. Opponents of the tax include the Northern Virginia Chamber of Commerce and local restaurants, who say the tax would hurt business and, by extension, restaurant wait staff, who could see tips and overall business shrink. Pat Herrity, one of two supervisors who voted against the proposed referendum, said the county needs to control its spending, rather than asking for more money from taxpayers, especially after raising their property taxes earlier this year. “It’s a regressive tax — it hurts our single, working parents and elderly, and those that really don’t have any options, more heavily than others. It’s really not good for Fairfax; it’s not good for businesses and I think we need to defeat it,” Herrity said. Supporters of the tax argue it will diversify the county’s tax base, which leans heavily on property taxes, and help keep teacher wages competitive with neighboring communities. The Fairfax Education Association and the PTA are among the measure’s champions. “We need to keep the best teachers; we need to lower class sizes; we need to take the pressure off the homeowner, who pays the heaviest burden,” said Supervisor John Foust. Foust said the county school system has pledged to use much of the additional money to boost teacher pay. He argued that the county has done as much as it can to hold the line on spending, but the time has come to boost revenue without turning to homeowners. If approved, the tax would kick in next July. Fairfax County voters will also decide whether to approval several bond referendums. The county is seeking approval to borrow $120 million to contribute to Metro’s capital improvement budget. The money would go toward the purchase of the new 7000 Series railcars, more buses and long-term maintenance projects. Another $107 million bond would pay for park renovations and land purchases. A third bond would provide $85 million to replace the Sully Senior Center, build a new Lorton Community Center, and renovate, expand or replace four existing homeless shelters. Learn more about the proposed meals tax. And read more about the bond referendums. Arlington County voters will also weigh in on several bond referendums. The county is asking for voters’ approval to borrow $139 million for several school construction projects. The money would help pay for two new schools, expand a career and technical school and provide for general maintenance. Another $58.8 million bond would cover the county’s portion of Metro’s capital improvement budget and would fund local street improvements. Another $98.9 million bond would pay for the Lubber Run Community Center, plus improvements to and maintenance on other county structures, including fire stations, the courthouse and a child care center. A $19 million bond would pay for general park improvements and land acquisition. Read more about the bond referendums. Loudoun County school officials are asking voters to support another construction bond to accommodate the county’s population explosion particularly in the Dulles area. The $233 million bond — larger than other school bond requests in recent years — would pay for three new schools: an elementary, a middle and a high school to serve the Dulles South area. Another six schools would have classroom space added. The elementary school, which will sit next to John Champe High School, and the middle school, planned near Lightridge Farm and Braddock roads, are expected to open to students in 2018. The proposed high school would open in 2021. Since 2000, student enrollment has more than doubled, and 45 new schools have been built to accommodate those new students, according to Loudoun County Public Schools. The county also wants approval for three other bonds: $76 million to build recreation centers in Ashburn and the Hal and Berni Hanson Regional Park, $17.5 million to expand a fire station in Leesburg and replace the Lovettsville fire station, and $18 million for road improvements. More information about the four bond referendums can be found here. Voters statewide will be asked to decide whether to ratify two amendments to the Virginia Constitution. The first amendment would enshrine in the constitution the state’s right-to-work law, which prohibits requiring workers to pay union dues as a condition of employment even if they are covered by collective bargaining agreements. The law has been on the books in Virginia for decades. A second amendment would give localities the option to provide a property tax exemption to the surviving spouses of police, firefighters, EMS or search and rescuers killed in the line of duty. To see a full list of Virginia’s bond referendums in every county, visit the state’s official election website.